The original recipe by Suzanne Goin included a complete Watermelon and Tomato Salad with Feta Cheese onto which the vinaigrette is drizzled. The salad is nothing more complicated than tossing together sliced tomatoes, watermelon, crumbled feta cheese, sliced shallots, and shredded mint. The vinaigrette works, of course, with just about any combination of summer produce, especially strong/bitter greens. 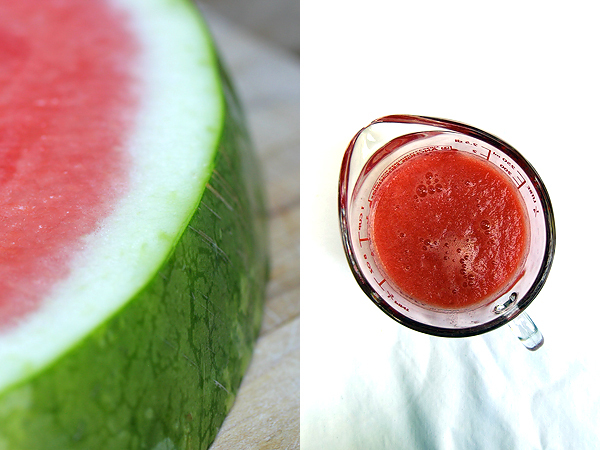 Place the watermelon juice in a saucepan and reduce over high heat until you have ¼ cup. It took about 40 minutes for. Cool. Combine the vinegars, watermelon juice reduction, salt, and pepper in bowl. Slowly whisk in the olive oil.